Here are a few tricks for health-ing up your hot cocoa, without sacrificing a sip of satisfaction. Plant-based milk is lower in protein compared to cow’s milk, but unsweetened plant-based “milks” like coconut and almond are also lower in calories, ranging from a mere 30 to about 60 calories per cup, versus 80 to 90 in the same amount of skim. They also provide the natural creaminess that fat-free cow’s milk lacks, and because they’re plant-based, the fat they contain is heart healthy and bundled with antioxidants. For the creamiest hot chocolate, try unsweetened coconut milk (the kind in the dairy case or shelf-stable quart containers, not the canned variety). One cup contains 5 grams of fat, but it’s so creamy that you can use three-quarters of a cup, mixed with a quarter cup of water. That brings the fat down to less than 4 grams, but the type of fat found in coconut milk has been tied to boosting metabolism and improving cholesterol profiles. 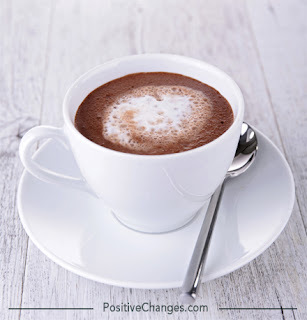 Standard hot chocolate mixes are usually made with cocoa processed with alkali. Alkalizing, or dutching, is a chemical process that lowers acidity, which has also been shown to markedly reduce the cocoa’s antioxidant content. Splurge on a canister, rather than a pre-sweetened cocoa mix. Many traditional cocoa mixes are sweetened with refined sugar and/or corn syrup, a mixture of sugar and artificial sweetener, or just the latter. Instead, reach for something that provides natural sweetness with other beneficial properties. Some top choices are: organic honey, blackstrap molasses, and organic maple syrup. All three have a unique and enjoyable flavor. Aside from natural sugar, honey contains antioxidants, and natural anti-bacterial, anti-viral, and anti-inflammatory compounds. Instructions: Warm coconut milk and water in a saucepan over low-medium heat, or in the microwave for one and a half minutes. Add honey, vanilla, spices, and cocoa powder, stir until cocoa dissolves, and enjoy. If you’re feeling adventurous, try experimenting with a sprinkle of other natural spices in place of or in addition to cinnamon and vanilla, like cardamom, cloves, or even chipotle or black pepper! If you’re already a dark chocolate fan and you have bars or tasting squares on hand, you can use them in place of cocoa powder and sweetener to whip up a steamy cup of goodness. Place two small or one larger tasting square of dark chocolate (70% cocoa or greater) in the bottom of a mug. Add two tablespoons of very hot, but not boiling water, and stir until the chocolate is dissolved. Add warmed coconut milk (in this case three quarters of a cup coconut mixed with two tablespoons water), vanilla extract, and cinnamon. This recipe allows you to skip the sweetener, since the squares already contain sugar. A 9 gram tasting square contains about 45 calories, compared to 40 in two teaspoons of honey and 15 in a tablespoon of unsweetened cocoa, so while the calorie difference is minimal compared to my recipe above, this version can offer a big savings compared to a pre-sweetened powder or coffee shop cocoa. For example, a tall hot chocolate from Starbucks made with skim milk and no whipped cream contains 210 calories, compared to an even 100 in this recipe above.